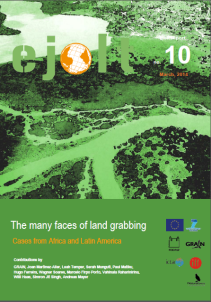 Ejolt report 10: The many faces of land grabbing. Cases from Africa and Latin America. The two big global crises that erupted in 2008 – the world food crisis and the broader financial crisis that the food crisis has been part of – are together spawning a new and disturbing trend towards buying up land for outsourced food production. ‘Land grabbing’ as these acquisitions are now called, is often led by the private sector (with support from governments) that sees opportunities triggered by the global financial, food and energy crisis. Characteristics of land grabbing are large scale displacement of the rural poor without proper compensation and the destruction of the local ecology to make space for industrial agriculture and biofuels. Recent studies emphasize the links between land grabbing, biomass extraction, and the interests and needs of the few members of a global class of consumers distributed across an increasingly multi-centric global food system, against the vast majority of the world’s population. Thus, the fight against land grabbing currently lies at the interface of the climate debate, food sovereignty, indigenous rights, social and environmental justice. This report describes and analyzes specific cases of land grabbing around the world within various socio economical contexts and with diverse social and environmental consequences as well as reporting successful cases of resistance to land grabbing to contribute to a preliminary understanding of the forces and also the conditions (opportunity spaces) for resistance, and the different types of alliances that can be made at different scales.